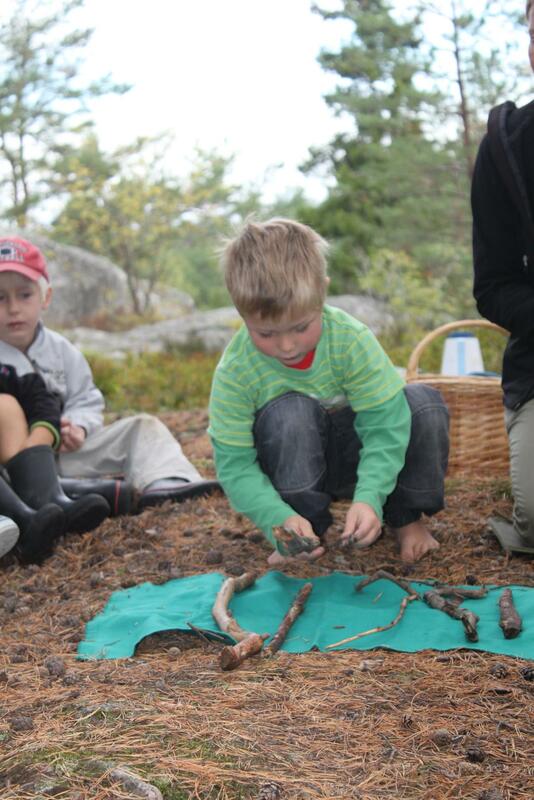 Skogsmulle, pronounced skogs-mull-a and translates as ‘forest creature’, is the Swedish early years outdoor learning pedagogy. Skogsmulle is the central figure in a concept that facilitates children’s learning through firsthand sensory experiences in the outdoors. The concept supports children’s development during their period of mastery through fantasy play. Skogsmulle, along with nature, acts as a third teacher helping develop children’s understanding of the world. The concept was created in Sweden by Gösta Frohm in the 1950s and today one in every four children there experience the magic of learning with Skogsmulle. Skogsmulle and his friends are stewards of nature and through their stories, fairy tales, songs and lessons they provide an inspirational, holistic and child- centered approach to achieving the early years curriculum. Being in the outdoors or frilufts, which translates as ‘outdoor life’,is part of the Scandinavian culture. Frilufts permeates all aspects of life, including children’s education. In Sweden there are outdoor nursery schools called I Ur och Skur or ‘Rain or Shine’ that embed the Skogsmulle approach into their formal curriculum, and with this their children thrive. They not only achieve academically later on in life but they also are among the happiest and healthiest children on our planet. Looking to Scandinavia we see best practice for creating balance between high achievement and wellbeing; something we all want as parents and teachers. In 2011, I, Darren Lewis, founder of the social enterprise Cyfleon, became the first leader in Wales to become trained in the Skogsmulle pedagogy at the inaugural International Leaders course held in Stockholm (for further details visit Juliet Robertson’s blog (www.creativestarlearning.co.uk/ international/skogsmulle-learning-for- all-the-senses). Seeing the potential of this pedagogy to enrich the Welsh Foundation Phase and wider early years practice throughout the UK, Cyfleon worked with early years consultants Juliet Robertson and Rose Joyce to create a blueprint for bringing the concept into the UK. The Skogsmulle UK concept identifies and embraces the unique cultural difference between the countries of the UK. In Wales, characters are bilingual and with Welsh identities; utilising our strong heritage of storytelling, myth, legends and our own language. of Skogsmulle, including supporting the UNCRC and sustainable development goals. For further details visit (www.friluftsframjandet.se/ skogsmullestiftelsen/32). The next International Symposia will be in Wales in 2017 and held at Dare Valley Country Park in Aberdare. The event will be bringing best practice in early years pedagogy from across the globe including Scandinavia, Germany and the far east into the Welsh valleys. Will you be there?